12 pages | 7 B/W Illus. Social theorists speculate about large-scale social questions, asking of any phenomenon, how is it possible? 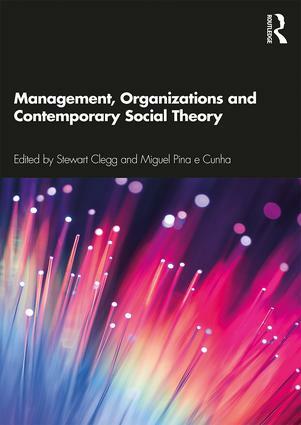 This book addresses how various social theories contribute key insights into the nature of organizations and management. The cast of characters to be found in this book have had a transcendental impact, including on the practices of the management and organization disciplines. For students, however, engaging with social theory in a conversation that is much broader and potentially richer than those that may have been previously encountered is not at first easy. The question is where to begin: this book provides answers. Drawing on research from international contributors, this valuable textbook is an essential resource for students and introduces key social theories and theorists making them accessible to a management audience. The chapters include objectives and end-of-chapter reflective questions, as well as a glossary for readers grapping with new terms, available in the book and as a downloadable document. Stewart Clegg is Distinguished Professor in Management at UTS Business School and a Visiting Professor at Nova School of Business and Economics, Lisbon, Portugal. The central focus of his theoretical work has always been on power relations, enabling him to write on many diverse and ubiquitous topics – as power relations are everywhere. He is the co-author of two widely used textbooks and a prolific contributor to leading journals in the fields of Organization Studies, Political Power, and Management. Miguel Pina e Cunha is the Fundação Amélia de Mello Professor of Leadership and a member of the Leadership for Impact center at Nova School of Business and Economics, Universidade Nova de Lisboa Lisbon, Portugal. His research deals with the surprising (paradox, improvisation, serendipity, zemblanity, vicious circles) and the extreme (positive organizing, genocide). He recently co-authored Positive Organizational Behavior (Routledge, 2019).